I visited the School quite recently and I came away from my visit and meetings with the new Principal, William Kemei and others, very much encouraged. As we enter the 70th anniversary year of our Alma Mater we must tell you that the Old Boy community is alive and well, with a growing commitment to the School, an active participation in the funding of projects, and setting the agenda with the School Board of Management. In addition to ourselves, the Laibon society is meeting more often and in addition to social events, is funding projects and bursaries, both as a Society and individually. Consequently, the younger generation are very interested in the history, values and standards established during the first 30 years of the School and are wanting to reinstate a number of traditions such as the sporting awards with colours and ties, together with blazer recognition of prefect’s rings and colours and braid. This consolidation of the philanthropic ideal amongst the Laibon is very noticeable in the last two years and the input of ideas and enthusiasm for new projects is a real encouragement for the future health of the School. At a recent meeting with the Headmaster, William Kemei, he confirmed his recognition of those values and fully supports all that we can do to help recreate the history with physical memorabilia such as team photographs, house photographs, plus testimonials and experiences of school life. All to be contained in a Trophy cabinet, or for display on walls around the School. This year the School has 1650 students with a Year 1 intake of 465 which is the equivalent of the whole school pupil number prior to 1979!! Educating this number within limited resources requires considerable ingenuity so all the support that the Old Boy community provides is very welcome and much appreciated by the Headmaster and staff. Under great pressure from John O’Grady the following missive has been compiled using nothing but a sharpened thorn tree needle, dipped in a concoction involving some of Jonny Havelock’s old socks soaked in Jock Anderson’s last curry. It may appear as though this is neatly written in modern day computer graphics but in fact that was how we were taught to write in those early days of the Special Maths project. It has been some time since we ( John, me, all contributors…) last wrote of the status of Lenana School and particularly the Old Boys and their contribution to their Alma Mater, so it may come as a surprise that there have been a large number of successes since the last barua. In the interim it won’t have escaped the reader’s notice that there have been Xmas festivities and since a New Year is upon us, though belated, let me welcome you to 2019, the seventieth anniversary of the founding of the Duke of York School. And the fiftieth year since the school was renamed Lenana School. And there have been and are various activities planned to celebrate this momentous occasion but I will return to them later. The swimming pool has been rebuilt and it was officially blessed by the Archbishop Korir in April and duly completed and commissioned with a swimming gala in July. It is now a full 25m pool and has been approved by the Amateur Swimming Assn. of Kenya for use in competitions. The communities springing up around the school will also be involved in the swimming development plan. The Optimum Kenya Trust, the Msaada Kenya Trust and most importantly, the Laibon Society funded and managed this very demanding and expensive project. As yet the changing rooms have not been built but the plans are in hand and when they are completed girls’ schools will also be involved in the plans for using Lenana as a swimming training centre once again. As has often been mentioned, there has been significant action on the redevelopment of the Golf course and the establishment of a golfing Academy at the school. In the period leading up to the release of the KCSE (secondary) results the Minister for Education made mention of the fact that Lenana has been identified as one of three “Centers of Excellence” for the development of sporting talent in Kenya and is the only one in Nairobi. Work is ongoing to get the first greens and tees ready in the hope that they will be inaugurated by H.E. The President of Kenya, Uhuru Kenyatta since it was at his suggestion and with huge support from the relevant Ministries, that the golf course project has taken shape. While on the subject of the Sanatorium…. There is currently a working group of Laibon, all of whom are doctors, who are hoping to upgrade the Sanatorium to establish it as a fully equipped and properly accredited Clinic. This will mean the purchase of more equipment and drugs and it is likely that the Ministry of Health will come in to assist in the project. It will also mean that better qualified medical staff will be inducted. All of this is desirable given that the school is now more than 1600 pupils strong. It is worth noting that Mr William Kemei took over from William Mwangi as Chief Principal of Lenana School early in 2018 and committed himself to better teaching methods and better results, as well as to more responsible management of school resources. He works closely with the Old Boys of all generations and we are encouraged by the vast improvement in the end of year results and the huge increase in “A” passes at KCSE level this year, bearing out his seriousness in keeping his promises. In November/December of last year the ICT centre in the school was boosted by the donation of 60 computers from Safaricom, a move instigated and driven by one of our Laiboni. The OKT and the Msaada Trust also donated significantly to enable the school to purchase the necessary software for the computers and the school collectively scored an “A” in the end of year exams. Further plans include an extension of the ICT facilities and the designation of Lenana as an ICT “Hub” among schools in Kenya. But the primary reason for the Old Boys Society must always be the continued camaraderie and the linkage back to the old school and the country itself in some cases. The Laibon society is stronger than ever and we are targeting 1000 paid up members this year for the first time, which shouldn’t be that difficult given that the subs are less than two pints of Guinness in Ireland, as I found out last summer! The Laibon genuinely want to meet the older Old Yorkists and to have a meal or a drink with them and a case in point was the visit by an “Old 49-er” Don Rooken-Smith from the USA. Lenana School is moving on and up. The sports Academy status is a huge plus in that it also ensures that the grounds are developed further and utilized more fully. There are plans to put in place a good boundary fence to stop the trespassing that has been tolerated for many years and it is hoped that the entrance to neighbouring estates will also be moved so that there is no transit facility down the railway cutting. We have had some notable sporting achievements but it is hoped that with the new attitude to sport development in the Ministry of Education, Lenana will again become a centre of excellence. The school orchestra is growing in confidence and competence and they have put on several concerts in the course of 2018 underlining their improvement. There was a Service at the school on the 27th of January for Founder’s Day and, as expected, several prominent personalities among our Old Boys attended. Lunch was served and speeches made. And, of course, there is a ding dong planned for Taunton later on this year and that should be well-attended by OB’s of all generations. The contribution Msaada Trust makes to efforts of improvement at the school, thanks to the generosity of Optimum Kenya Trust and those who contribute so generously is both highly valued and regularly acknowledged. 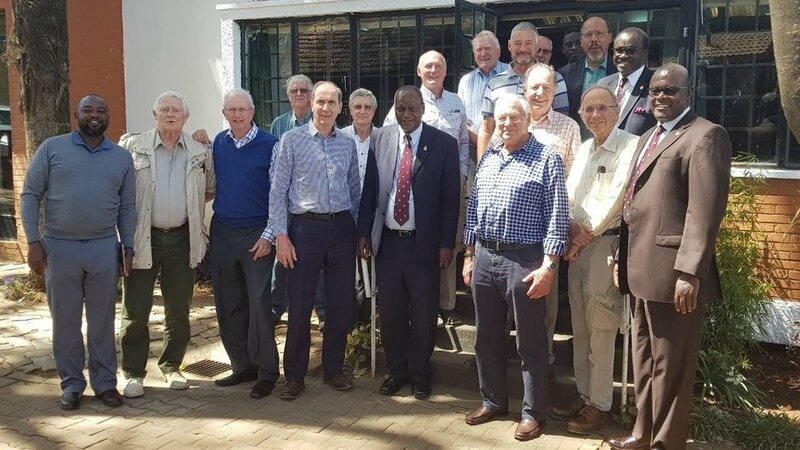 No significant school anywhere in the world can survive without the support of its Old Boys and Lenana is no exception, either in its significance or its need. And that contribution may be in the form of contact and communication alone, but even that is important to fellow old boys, to the school and to its pupils and to all who now see our alumni as a model of such bodies in this country. I met several of our bursary recipients at the school on Founders Day this year and I emphasized the importance of their successes; how their success gives our donors hope, how they give their families hope, how they give their successors hope. I realized what thoroughly decent guys they are. I really wish that there were more opportunities for those who question the value of what we are doing by funding these guys, to also meet with them too. Our safe and transparent Bursary scheme is so successful that we have been asked by other donor groups to do the oversight on another 7 bursaries and more will, probably, follow those. I anticipate that there will be maybe 40 by the end of the year. And God knows there are a lot of needy cases in that school! National Schools Golf Academy under construction; more funding now committed for completion. School Chapel completely refurbished by one individual Laibon; complete new floor, all surfaces cleaned and painted, roof repaired – a really good job too. Each boarding house being refurbished in turn, to enlarge and accommodate the number of pupils. Swimming pool completed and in use. New ITC centre opened with the donation of 60 computers from Safaricom and using software donated by OKT/Masaada. Aggregate results: A in ICT for Lenana. ICT Ministry ( Joe Mucheru, CS is an old boy ) announced will donate 50 laptops and 100 desktops to the school. So, yes, there is good reason to be happier, but we must not take our foot off the pedal. I want to update you more fully on our bursary recipients. The first 5 bursary recipients we identified as being both high performers but financially poor back in 2017 and whom we have funded during the last 3 years, took their KPSE exams during their last term at the school in December 2018. We are pleased to report that 4 out of the 5 achieved A passes and the other one a B+ pass. Two of the five are known to be going on to University to study medicine and dentistry. Another two may go onto Uni in Australia, funded by OY Nigel Champion. As will be required, the OKT/MKT will help financially if asked to do so. At the moment we, the OKT/MKT, continue to fund our 11 bursaries for 3rd and 4th formers (attendance at Lenana is for 4 years only) and we expect to be funding at least 5 more 2nd year pupils and maybe even a 1st former or two during 2019, for a minimum of 16. Your donations will obviously help us to do just that and more. I also want to mention, at greater length, the upcoming Taunton event. John Tucker and Ken Doig have put together a 70th Anniversary of the founding of the DOY reunion to take place at the Holiday Inn hotel on the outskirts of Taunton on the weekend of the 27th and 28th of July 2019. Full details of the event are available from John on pukkatuk@gmail.com or from Ken on kendoig@hotmail.com. Needless to say I, Nigel Gaymer, Al May, plus our wives, will be there as well as, I believe, Dave Lichtenstein who has been instrumental in keeping us together all of these years, and who will be flying in from Oz. Finally, let me express some pleasure. A major hope of those who established the Optimum Kenya Trust and the Msaada Kenya Trust was that we would encourage the Laibon Society to “take up the reins” for the future. Although the Laibon Society was active before our establishment, it was in an uncoordinated way. They are now organizing themselves very effectively and well. One such example is the golf tournament taking place at the Karen Country Club on Friday the 12th April 2019. In the coming years I expect that we shall coordinate and cooperate with them more and more. We shall hopefully prompt each other into generating more donations, more bursaries and funding more projects at the school. Thus we shall prove that, no matter whether you are pre 1969 or post 1969, WE ARE ALL ONE COMMUNITY, sharing the same or similar memories of the school and seeking to enhance the Lenana experience for all the current and future pupils. With our salaams and best wishes to you all.